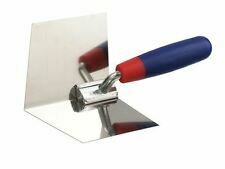 Drywall lining tool soft touch outside corner trowel. Outdoors & Garden. Zone 4 - Bulgaria, Estonia, Italian Islands, Latvia, Lichenstein, Macedonia, Serbia. Zone 5 - Gibraltar, Iceland, Romania, Turkey, Lithuania. This R.S.T 8200 drywall internal corner trowel with soft touch handle. For applying filler or plaster evenly to internal corners. Safety & Security. An invoice is provided for all orders. All orders are dispatched within 48 hours of being cleared. 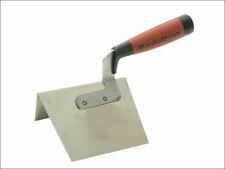 This R.S.T 6205 drywall external flexible corner trowel with a soft touch handle. For applying filler or plaster to external corners. Safety & Security. An invoice is provided for all orders. All orders are dispatched within 48 hours of being cleared. STHT0-05622Stainless steel blade prevents rusting and provides durability. Bi-material handle for comfort and protection. Hang hole in handle for easy storage. Blade tapered along top to create a smooth even finish. This R.S.T 8200 drywall internal corner trowel with soft touch handle. For applying filler or plaster evenly to internal corners. No longer want your item?. We will mark the order as Dispatched. We hope it has been a positive experience and you award us a positive review. PREMIUM STAINLESS STEEL BLADE IS RUST RESISTANT. SIZE: 4 1/2" X 3 3/8" EXTERNAL LEADING CORNER. NEW BLADE DESIGN PREVENTS DIGGING INTO CORNERS AND PROVIDES CLEAN FINISHES. LEADING CORNER RADIUS 103° FLEXES TO 90° FOR PERFECT CORNERS. This Ragni External Corner Trowel is made from high quality stainless steel and has a hold-fast, non-slip handle with a finger guard. Its shape prevents digging in. The trowel has a radius of 90° for perfect corners. 2 Piece Corner Trowel Set With Carbon Steel Blades - 120mm. 120mm long carbon steel blades with polished wooden handles. Double hang shank. For accurate corner finishing when plastering. Product Information. SuperPROF ECO 90 Degree Plastering Spatula - Stainless Steel fitted with an Ergonomic SoftGRIP handle. Blade size: 100mm. Inside Corner TROWEL with WOOD HANDLE. Item pictured is the one you will receive. check out those photos. monitor settings display colors differently). (Note: color is subjective and different for everyone. Produces a tight, clean finish after plastering corners. Fully polished and lacquered. Features Spring Tempered Blade Soft Grip Handle. Specifications Internal leading corners with radius 100. This does not effect your statutory rights. The Faithfull Prestige Internal Corner Trowel has been designed to provide a clean edge for internal corners. The blade is made from one-piece of stainless steel. Fitted with an ergonomic soft grip handle that provides superior grip. 120mm long carbon steel blades with polished wooden handles. Double hang shank. For accurate corner finishing when plastering. Goods under £150 - £18.95 Goods over £150 - £24.95. - AB, BT, IV, KW, PA, PH, all Islands. 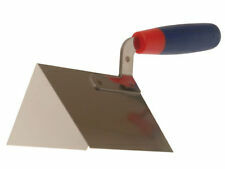 Stainless Steel Trowel. ~ stainless steel, acid-resistant, thickness: 1.0mm. ~ ergonomic handle made of beech wood, varnished. Paint Brushes & Rollers ETC. Gloves & Safety Masks. Trolley Jacks & Oil. Moore & Wright MAW4006 4006 Engineers Square Grade B 150mm (6in) petrovsv(204). Cylinder Head Removal Tools. Spanners- Flex Head. HEAVY DUTY INTERNAL CORNER TROWEL. STAINLESS STEEL. PAINTED SOFT GRIP WOODEN HANDLE FOR EXCELLENT COMFORT WHILST WORKING. ORIGINAL MADE IN GERMANY. Made In Germany. SIZE: 110 mm. Building Materials And Products. Lightweight tool made from one piece of flexible stainless steel with aluminum mounting. Resilient DuraSoft handle with finger guard. Blade set at a 103 degree angle that flexes to form a perfect 90 degree corner during use. This R.S.T 6205 drywall external flexible corner trowel with a soft touch handle. For applying filler or plaster to external corners. Carbon steel blades with soft grip handle for user comfort. Car Care & Accessories. Expert Quality, for accurate neat finishing when plastering internal and external corners. The Spear and Jackson Tyzack External Corner Trowel is used to produce a tight bubble free external corner joint when plastering and features a stainless steel blade which is offset to allow use right up to the ceiling or down to the floor or skirting. The trowel is finished with a soft feel handle for comfort. . Inside Step Trowel 1/2" Batter at 6" 1/2" Radius. Curb, Gutter, Step. 1/2" Batter at 6". Kraft Tool Model No. Stainless steel concrete step tools are rivet free. 8" x 4" with a 1/2" radius and 4" lip. This R.S.T 8200 drywall internal corner trowel with soft touch handle. For applying filler or plaster evenly to internal corners. Handle: Soft Touch. Type: Internal Corner. find your part. A signature will be required. Hardened and tempered steel blade with soft grip handle Size: 127 x 100mm Am-Tech branded Perfect for both professionals and casual DIY-ers Ideal gift . Curb, Gutter, Step. Outside Curb & Sidewalk Cove Tool 1" Radius Stainless Steel. Stainless Steel outside cove tool is 6" Long x 4" Wide with a 1" Radius. Kraft Tool Model No. Outside Step Trowel 1/2" Batter at 6" 1/2" Radius. Curb, Gutter, Step. 1/2" Batter at 6". Kraft Tool Model No. Stainless steel concrete step tools are rivet free. 8" x 4" with a 1/2" radius and 4" lip. Drywall Inside Bullnose Corner Tool Stainless Steel. Bullnose tool is made of lightweight flexible stainless steel. Fitted with a smooth wood handle. Kraft Tool Model No. The resilient Durasoft handle creates a soft feel and minimizes fatigue. Product Type: Inside Corner Trowel. Building Materials And Products. Handle Material: Durasoft. Type: Smooth. Blade Length: 6 in. The resilient Durasoft handle creates a soft feel and minimizes fatigue. Product Type: Outside Corner Trowel. Building Materials And Products. Outdoor Living And Furniture. Type: Outside Corner. Handle Material: Durasoft. Curb, Gutter, Step. Outside Curb & Sidewalk Cove Tool 3/4" Radius Stainless Steel. Stainless Steel outside cove tool is 6" Long x 4" Wide with a 3/4" Radius. Kraft Tool Model No. Never used. Still has the sticker on it. Stainless steel.